At Kinlay House Dublin, we have prided ourselves for over 25 years on providing the most Irish hospitality, a fantastic location in a beautiful listed building, and helping each of our guests to experience the best that Dublin has to offer. 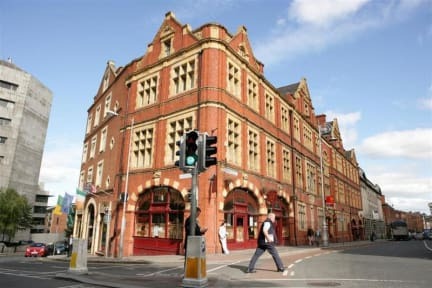 We offer clean, secure and budget accommodation, located in the legendary Temple Bar area, and are situated just minutes from Trinity College, Grafton Street and George’s Street as well as the renowned nightlife havens of Camden Street and Harcourt Street. You’ll also be pleased to hear that you won’t have to drag your luggage all around Dublin, as it’ll only cost you €12 for a return ticket to get the number 747 bus to us from the airport to our front door! Every guest can make the most of our free light breakfast including cereals, toast and jams/spreads, big self-catering kitchen, huge chill out room with a pool table, a Netflix enabled TV and plenty of space to relax in groups or in a smaller gathering. Kinlay House backs right onto a traditional Irish pub, where you can often enjoy live music or their large outdoor terrace. We also have tablets for guest use, and of course, free WIFI! There is a free walking tour which departs from our reception every morning at 10:45! We also provide free city maps, event guides, and if that wasn’t enough, our staff are very knowledgeable, multilingual and can help you find the best events and activities to enjoy whilst you stay with us. We can offer you different types of accommodation to make the most of travelling solo, in a small gathering or a big group. 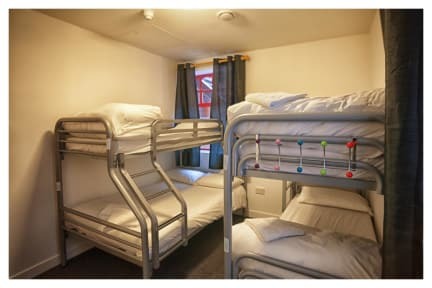 This includes rooms ranging from 4 to 24 bed dormitories, including one female only dorm, and a selection of private triple, twin/double and single rooms with ensuites or shared facilities.